I met Oliver last December. I had hit a roadblock in my riding where I could no longer progress on lesson horses and I was at a barn that just wasn’t giving me the things I needed anymore. I had started looking for a horse of my own so I could start moving forward again. With a low budget and not a lot of help, my horse search was pretty disheartening until I found Oliver. Oliver was an off the track thoroughbred with one racing start and a last place finish. He was at a rescue that had picked up from a low-end auction. He was skinny and under muscled and didn’t look nearly his age. But underneath all that he had a loving heart and work ethic like I had never seen. He was just happy to get taken out and given a job to do and he absolutely excelled at everything I asked of him. I was in love immediately and took him home a week later. He has fit so well into my family. 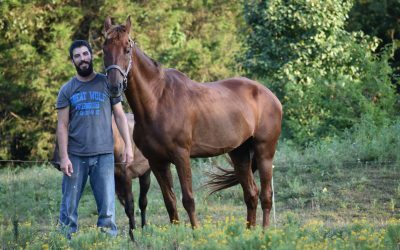 He brought back a love of horses and a love for the sport that had been stuck in a rut for a while. I’m grateful to have found him. He rescued me just as much as I rescued him. We’ve been able to grow together, and I know that our journey is only just at its start. To me #righthorse means falling in love with your horse for who they are and for what makes them unique. It’s finding more than just a horse to ride, it’s a friend and a partner. 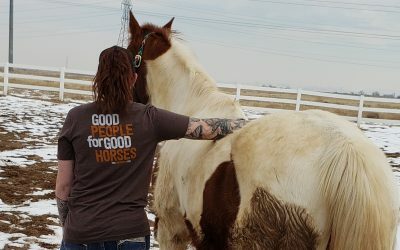 I was blessed enough to find a horse that loves all the things that I love and even in the days we don’t get out and ride or compete we can always still just be around each other and connect. Oliver to me really brought new life to phrase “fall in love with the horse first and the sport second”.